When a day at the park doesn’t go as planned, find out how Carmin takes a stand! Carmin Cares is the simple and touching story of a little girl who makes a difference- all because she gets gum stuck on her shoe while playing in the park! Through lovable characters and easy to follow rhymes, this beautifully illustrated picture book sends a subtle yet important message about appreciating our world. Review: Carmin Cares is a super sweet book. Its detailed pictures with bold colors draw readers in as Carmin takes us to the park along with her little dog. This adorable book touches on the importance of maintaining our parks clean and how we can all make a difference. I invite you to read this little surprise with your child. This is the second book LGB has had the pleasure of reviewing in the Pumpkinheads series. I look forward to next week’s book, Danza’s Message. Note to Parents: Carmen Cares is one in a series of picture books for children from the Pumpkinheads focusing on character education. It has won ***GOLD Mom’s Choice Awards Winner 2013*** This book is perfect for 2-5 year olds. Enter below to win not one but all four books. 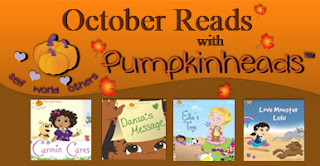 Pumkinheads has a wonderful interactive site for your little ones to explore, visit and enjoy.